OK, in a matter of hours I managed to get their attention on Twitter. As an organic chemist, I find this discussion (below) quite bizarre. How can one step contain 26 “stages”? Has anybody ever heard a chemist say “Look, I transformed A into B in one step, but it required 26 stages”? Has a chemist ever used the term “stage”? Would any journal accept such a transformation with “One step synthesis of…” in the title? I don’t think so. @SciFinder Right. Could you please in detail describe the difference between a step and a stage? @SyntheticRemark Our experts in the CAS Customer Center are more than happy to describe how they differ. Give us a call. I’m very tempted to place that call. Note that it is one step, but 26 “stages”, ha! I’d love to hear what they’ve got to say on it. To have a stab at a definition, perhaps you could call it a stage if there’s no purification between them? So if it was heat reagents A and B to reflux, then cool to rt and add C, I guess you could call that 2 stages of a 1 step reaction? It still seems pretty arbitrary though, and in no way fits the horror you’ve presented above. 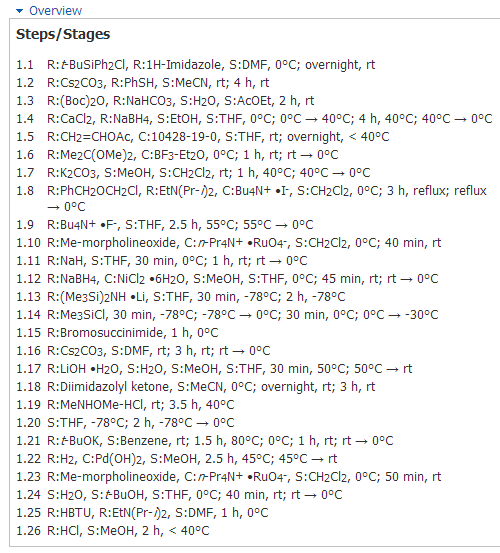 Those 26 stages have reagents added at practically every step, and around 20 changes of solvent. That’d be “fun” to sort out if taken through crude until the end. From my experience of dealing with CAS, the person tweeting won’t be a chemist, or at least will have limited relevant expertise. I imagine the ‘multi-stage, single-step’ thing is a stock phrase they’re been told to use, and so they have no idea how absurd it is in this case. For example, if you send a query to verify a CAS number, then it’s handled by an admin-type person who sends you the CAS registry entry. When you then email then back to say that the stereochemistry is wrong in their record and attach a load of papers demonstrating this, you get passed on to someone else. I don’t think CAS have tried to redefine the word ‘step’, just that someone who doesn’t know any better is using a justification intended for something like the ‘stages’ of a Swern oxidation. And, obviously, someone has abstracted your 26-step reaction sequence without turning their brain on. However, and here is the take-home message to SciFinder, so listen up guys! Given your arbitrary distinction between steps and stages (whatever the latter is supposed to mean), please make it possible to search for one-step, one-stage reactions! And yes, the reference itself was a 30+ STEP natural product synthesis. Your example is obviously one where this approach has limitations. I encourage you to share your thoughts with us. We frequently offer user testing and would be happy to reach out to anyone interested in contributing. Thank you! Your quote from the indexing guys says a lot about what is considered a single step, but not a lot about what isn’t. As a synthetic organic chemist, I generally agree with the quoted description of what constitutes a ‘stage’ of a synthetic step, rather than a step in its own right. If a reaction involves adding one reagent, then changing temperature, then adding another reagent and so on, all without isolating anything, then yes, that can be considered a single synthetic step, with multiple stages. However, the vast majority of the synthetic chemistry community would agree that once you work up, purify, or otherwise isolate the contents of your reaction, that is the end of a synthetic step. In the simplest terms, once it comes out of the flask it started in, it’s a new synthetic step. The example given in the blog is not “one where this approach has limitations”; it is one where this approach has been wholly misapplied. Even without seeing the paper, it’s patently obvious that this is a sequence of distinct chemical steps, where isolation will be necessary after most of them. The idea that these 26 steps (yes, steps) were carried out simply by “addition of a new reactant, reagent, catalyst, or quenching solvent” without ever stopping to isolate a product is beyond absurd. Any, *any* chemist with experience of synthetic chemistry would be brought to tears at the idea of trying to fish a product out of the mess that would be produced by that sequence of reactions in a one-pot ‘single-step’ procedure. With the greatest respect, and trying desperately not to be patronising, if you don’t understand what I’m talking about, then please pass this on to someone who does. I find it very troubling that the CAS response, both on Twitter and here, has been to regurgitate your definition of a single-step reaction, rather than to look at the reaction in question and see that it is absurd. Must try harder. I have no doubt that there are some very knowledgeable organic chemists working for you, and I urge you to make the most of their expertise. My apologies for the delay. 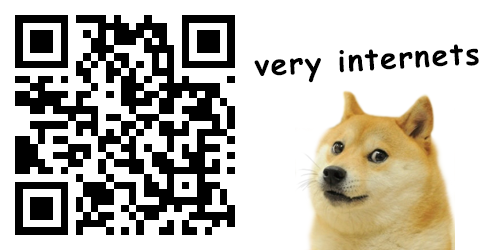 We take user input very seriously and I wanted to engage our most senior experts on the reply. The primary goal of the organic chemists on our staff is to help our users find chemistry disclosed in the scientific literature. To do this well, some standardization occurs as they index information for inclusion in our databases. The example given in this post looks to be a reaction from a lengthy 2012 Japanese patent. As you might expect with some patents, the inventors did not fully disclose a number of reaction details, in this case specifically relating to clear steps. When this occurs, we could: 1) exclude the reaction; 2) index the reaction and embellish the step-related detail based on our interpretation of the data; or 3) index the reaction based on other fully disclosed reactions in the same document (and assign “stages” to differentiate it from full disclosures). We choose the third option to meet user needs for comprehensiveness. I do want to note that this same patent contained other reactions that were fully disclosed and indexed in the typical step-wise manner, as you would expect. It is not common to find examples like the one in this post, but it does occur. And it happens more often in legal documents, such as patents. We’re constantly evaluating process improvements and we appreciate your feedback. We will certainly continue to pursue ways to distinguish these types of reactions from the rest. I’ve also shared the interest raised in this post for a one-step, one-stage reaction filter with our development team. Again, thank you for your comments and frank feedback. I appreciate the difficulties in indexing reactions that lack full details or that don’t necessarily fit the usual format (I have some experience of abstracting/indexing myself). However, I’d say it would better serve the user if you broke a sequence like this up into (perhaps slightly arbitrary) steps. A good rule of thumb would be that if the solvent changes, call it a new step. It might not precisely reflect the (badly) reported process, but in the vast majority of cases it would be far closer to reality than dozens of ‘stages’ without isolation. Failing that, drfreddy’s suggestion of letting the user limit number of ‘stages’ as well as number of steps is a good one. Thank you very much for these clarifications, Peter. I personally look forward to being able to search for one-step, one-stage reactions.